December 2016 - Perry Hood Properties, Inc.
Is your home’s interior in need of an update? Many times, a fresh coat of paint is all that’s needed to freshen up the look of a particular room. And winter is actually a great time to start painting. While it’s true that it can be difficult to gauge how light will affect the room during the sunny days of summer, that may be the only negative to a winter painting session. Here’s why so many prefer to paint their home in the winter. The more moisture there is in the air, the less likely paint will apply and dry evenly on your walls. Painting in humid conditions typically means you’ll need to repaint sooner. It can also result in discoloration. As you know, Oklahoma summers bring plenty of humidity. In the winter, however, the air is usually much dryer. That creates ideal conditions for applying paint. When the weather is beautiful and warm, chances are you’d prefer to spend time outside. It’s a great time to do yard work, but not a great time to be stuck inside painting. However, when it’s cold and gray outside, you’ll be spending more time inside. That means it’s a great time for an indoor project like painting. That also means you’ll be spending lots of time in the rooms you’ll be painting, which will give you a better idea of what you want to change. There’s nothing like staring at a drab or outdated paint job to give you inspiration for your next paint color. Even though the winter offers some great reasons to paint your home’s interior, most homeowners start their paint projects in the summer. 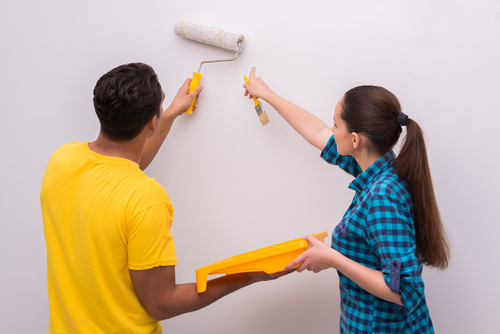 With more demand, professional painters typically charge more in the summer. Even if you’re planning to paint yourself, you’ll find supplies cost more during the summer months. During the winter months, you’re more likely to find sales on paint supplies, or a special offered by professionals. You’ll save money and typically end up with a better finished product. If a fresh coat of paint isn’t enough, browse through our selection of available homes. Find a home in Tulsa, Broken Arrow, or Bixby that fits your family and your needs, or pick the perfect floor plan and start building with us today!